Gerbil pregnancies can be tricky to identify if you aren't anticipating them, because gerbils are so small and their gestation period so short. If you're expecting a pregnancy or you notice a sudden and rapid weight gain, though, you can tell with relative ease that babies are on the way. 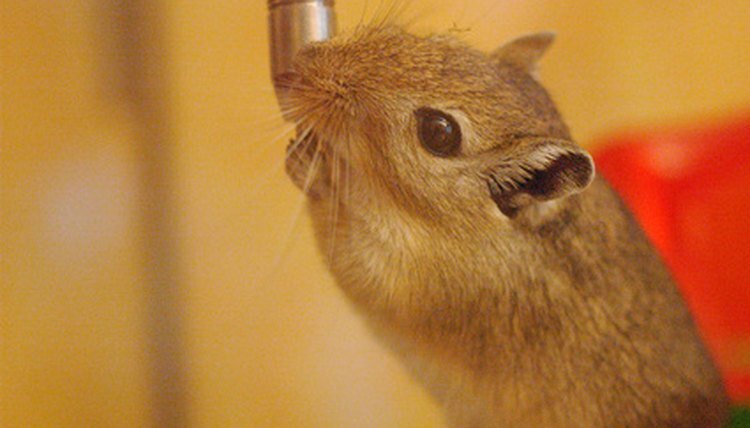 Don't count on unusual cravings or morning sickness, though -- a gerbil's weight is virtually the only way to tell that she's expecting. Watch your gerbils carefully when they're old enough to mate. Having a boy and a girl may have seemed like a good idea when you adopted them, but they can start mating as early as three months into their little lives. If the male and female are old enough to mate, they probably will, and you'll have a pregnancy on your hands. Hold your female gerbil in the palm of your hand. If her stomach is brushing your hand, it's probably full of babies. If she's not pregnant or she's been pregnant for only 20 to 23 days, her stomach hasn't expanded enough for this test to work. Check her shape. Pregnancies don't last long in gerbils, and they don't really show until it's almost time to pop. Around day 24 -- the earliest point at which she may be ready to deliver -- you'll notice her body has become pear-shaped. You may notice her stomach occasionally move, because the pups inside are getting too big and changing position. Her delivery date is imminent.